How to draw Anime Girl foreshortening hand. This video tutorial shows you how to draw Anime girl with foreshortening hand. This tutorial is easy to follow basic tutorial for all levels. You can scroll down further to see step by step images with instruction. In this one you will learn to draw Anime or Manga character female, girl with foreshortening perspective and close up of a hand. We provide you with both FREE tutorial video and step by step tutorial. Let begin drawing and sketching anime girl character series for manga, cartoon and comics. First I will start very light rough sketch (or I called it construction lines) of a head, torso, hip, then arm in form of basic geometry shapes. Depending on what you focus on, aim for the big form first. It’s a lot easier to draw when you break down body part in geometry first. Then smooth out the geometry form by drawing over the light sketch construction lines. It is easy to make your line solid and pretty when you already have something to go off from. 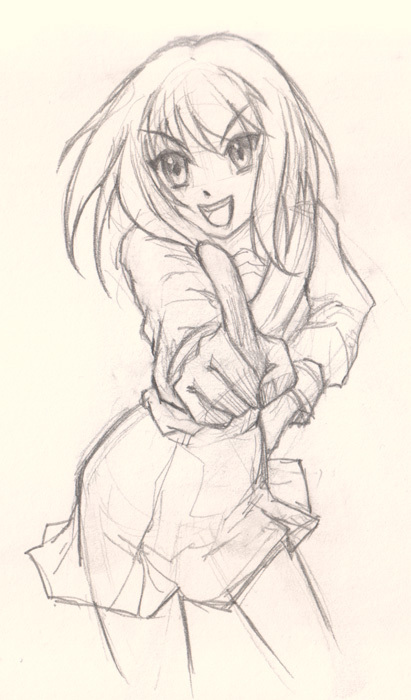 Here is a final image drawing anime foreshortening and hand. Below are step by step how to draw Anime girl with foreshortening arm.